I am delighted that NLP University have sanctioned us to run their NLP Master Practitioner course starting in March 2017 and even more delighted that Judith (Judy) Delozier has agreed to teach on the programme. She co-wrote many NLP classic works including Turtles All The Way Down, The Therapeutic Techniques of Dr. Milton Erickson Vol 2 and the Encyclopedia of NLP. 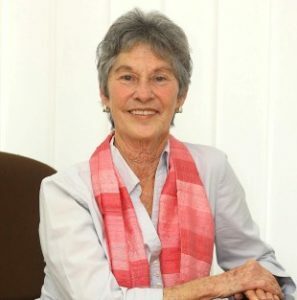 She is the co-founder of New Code NLP and has been responsible for the development of many techniques and principles such as Reframing, Perceptual Positions and Somatic Syntax. With Robert Dilts, she has designed and taught the NLP University (NLPU) curriculum since 1992. During my NLP career I studied with many NLP names, including Bandler and Grinder. However it wasn’t until I came across Robert Dilts that I found a person whose values and approach met mine. I was also immensely impressed with the huge number of NLP processes and techniques he invented, many of which I consider to be the best in the field. I then decided I wanted to formally qualify as an NLP trainer with him at NLPU in Santa Cruz – it was there that I first met Judy. The trainer training at NLPU, provided by Robert and Judy, not only provided me with the skills to teach using NLP, it also ignited in me the inspiration and vision to pursue NLP training as my main career. That was in 2005. For the past few years, I have been invited back to teach alongside them in the University California Santa Cruz campus. I have also been teaching the NLPU Master Practitioner with Judy in China and Malaysia. It is an honour and a pleasure to do this. Judy is one of the best presenters and trainers I have ever witnessed – not just in NLP but in all types of training. She is warm, witty and immensely caring. She is the ‘secret’ that many discover in Santa Cruz – and this secret will be coming to the UK soon! See NLP Master Practitioner for more information, starts 1 March 2017.